You may be able to make a claim for unfair dismissal if you have been dismissed and your company has not followed the correct procedure or doesn't have a good reason for dismissing you. Where an employer dismisses an employee without good reason, that employee may be able to claim unfair dismissal in the Employment Tribunal under the Employment Rights Act 1996.
Who is eligible to claim unfair dismissal? Be an ‘employee’ (whether part time of full time), not a worker or self employed. Have one year’s continuous service if employed before 6 April 2012 and two years’ continuous service if employed on or after this date (the qualifying period) at the effective date of termination. There are, however, cases where the dismissal is ‘automatically unfair’ and in most such cases there is no requirement for a qualifying period of service. 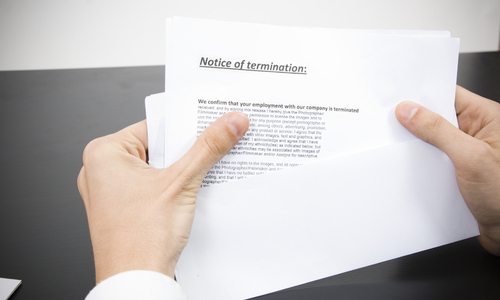 Where the employer terminates the employment with or without notice. Where a limited term contract expires without being renewed on the same terms. The Employee resigns (with or without notice) and can establish that they were ‘constructively dismissed’ as a result of the employer’s repudiatory breach. Constructive dismissal, however, is not discussed here. However, with the introduction of the ‘employee shareholder status’ in Autumn 2013, even if an employee has satisfied the above criteria, he may not be entitled to bring a claim for unfair dismissal if he has traded this employment right in exchange for shares in the company in which he works. The employee’s lack of capability or qualifications to do the job. ‘Capability’ can include the employee’s ‘skill, aptitude, health, or any other physical or mental quality’. The employee’s conduct (misconduct). Examples of this might include the employee’s failure to obey reasonable instructions, theft, violence, or repeated poor attendance. Most employers will include examples of poor performance in their employment contracts or staff handbooks. Ceasing or intending to cease to carry on the business for the purposes of which the employee was employed by it. Ceasing or intending to cease to carry on that business in the place where the employee was so employed. Having a reduced requirement for the employee to carry out work of a particular kind or to carry out work of a particular kind at the place where the employee was employed to work. A statutory restriction, whereby the employee’s continued employment would actually contravene any duty or restriction imposed by or under any enactment. For example, where the employee’s continued employment would breach the immigration rules. Some other substantial reason (SOSR) of a kind which could justify the dismissal of the employee holding the job in question. Retirement used to be a fair reason for dismissal but, as of 6 April 2011, this ceased to be the case when the default retirement age of 65 was abolished. Once the employer has established a potentially fair reason from one or more of the above options, the Tribunal would then look to see whether the employer acted reasonably in deciding to dismiss the employee for that reason. For asserting a statutory right. Due to the transfer of an undertaking. Due to participation in trade union activities. Whether the employer’s decision was within the range of reasonable responses that a reasonable employer in those circumstances might have adopted. The Tribunal will not substitute its own view for that of the employer and may only take into account facts known to the employer at the time of the dismissal. The size and administrative resources of the employer’s business. For example, the larger the company and its administrative resources, the less ready it should be to dismiss. Whether there has been procedural fairness. This will apply in most cases, regardless of the reason for dismissal. The employee should be made aware that they are at risk of dismissal, and why, and should be allowed to make representations. In some cases, they should also be allowed a right of appeal. Any relevant ACAS Code of Practice. Failure to follow the ACAS Code of Practice on Disciplinary & Grievance Procedures will not automatically render a dismissal unfair but may lead to an increase/decrease in the compensation of up to 25%. Note that the Code does not apply to redundancy dismissals or the non-renewal of a fixed term contract. A claim for unfair dismissal would be brought in the Employment Tribunal by lodging a claim form (ET1). This must be done within 3 months (less one day) of the effective date of termination. As of Summer 2013, the employee will need to pay a fee to lodge his claim and, should the case go to full hearing, another fee prior to the hearing. Once the employee has established that he has been dismissed, the employer would be required to demonstrate the reason for the dismissal and that the reason falls within the five potentially fair reasons. The tribunal would then consider if the dismissal was fair. The burden of proof here is neutral. Re-instatement - which would see the employee return to employment (with all of the same terms of employment) as if he had never been dismissed. Re-engagement – where the employer (or associated employer) must engage the employee in a comparable job to the one from which he was dismissed. Compensation – will usually consist of a basic award (based on the number of years’ service and a week’s pay (now capped at £450)) and a compensatory award (the maximum now being capped at £74,200 as of February 2013). The Tribunal may also make an award of costs.